When you think about gaming mice Razer is probably one of the three brands that comes to your mind. This company started making gaming peripherals in the late 1990s and became pretty well known thanks to its Boomslang mouse. 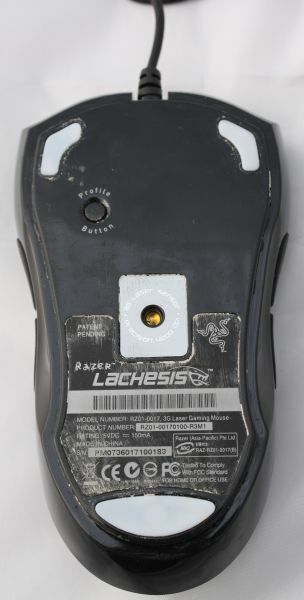 In this review I'm taking a closer look at the Razer Lachesis mouse, this model was launched at the Games Convention in Leipzig in 2007. Almost ancient history in the tech world, but better late than never. 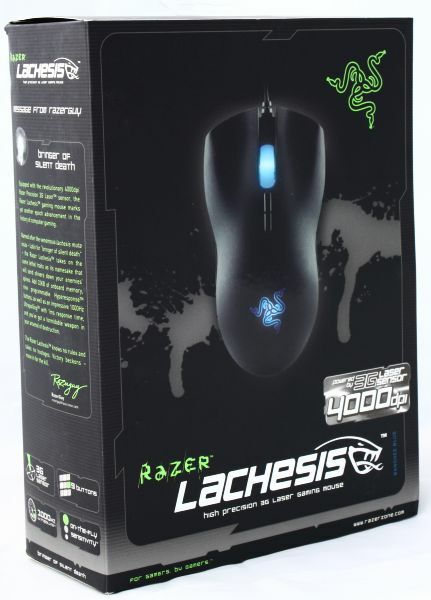 The Lachesis is a gaming mouse with a 4000DPI 3G laser sensor, up to 100 inches per second tracking, nine buttons, 1000Hz ultrapolling with 1ms response time, 32KB of onboard memory for your gaming profiles, and on-the-fly sensitivity adjustment. Razer names many of its products after dangerous creatures, and this gaming mouse is no different, the South American bushmaster (lachesis muta) is the largest pit viper in the world. It's one of the most dangerous snakes in South-America, the bushmaster can reach lengths of up to 3 meters. Definitely not something you want to find in your bed at night. Additionally, lachesis is also Latin for "bringer of silent death". Inside it is the mouse and various other items like two Razer stickers, a CD with the drivers, a manual and even a certificate of authenticity. 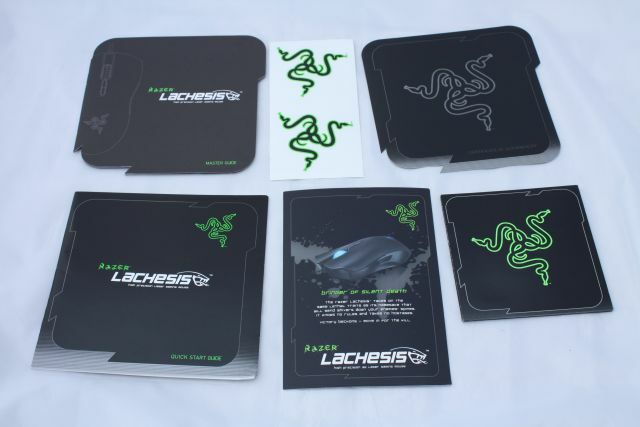 The Razer Lachesis has an ambidextrous design, the top is made out of one piece and has a rubberized non-slip grip. 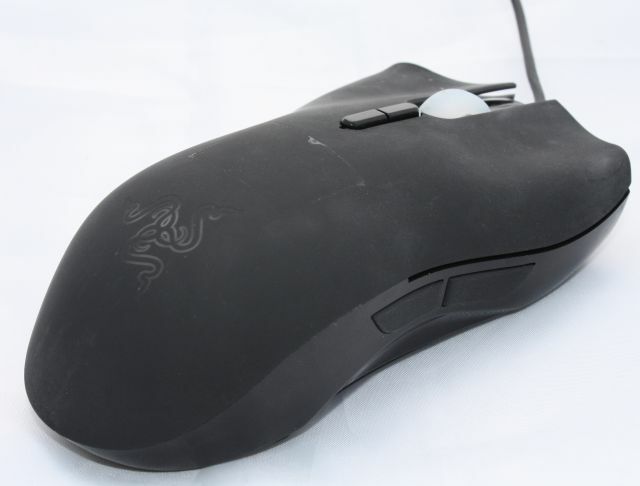 The entire mouse is black, and the front has a large Razer logo with a pulsating blue, red or white LED behind it. 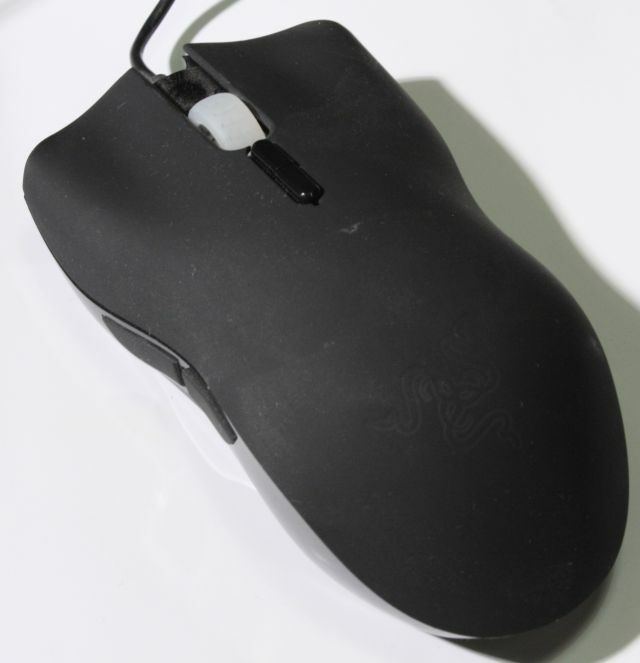 Razer says the design of the mouse is favorable to gamers who prefer a so-called "claw grip", which means you control the mouse with your fingers rather than your palm. The button has three large teflon feet and a Profile Button, pressing this button will advance one profile. 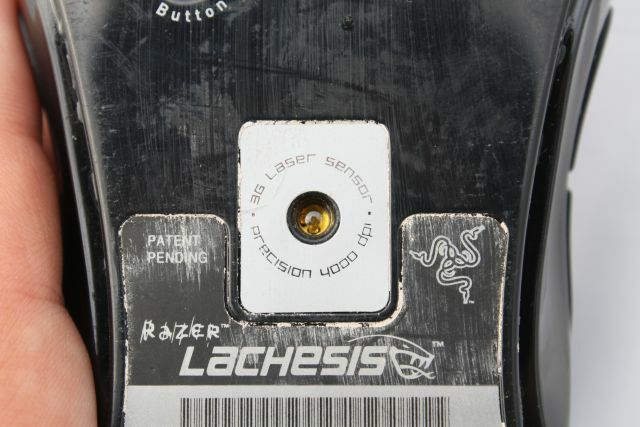 Below is a closeup of what makes the Razer Lachesis tick; its Razer 3G Laser sensor. This sensor supports a sensitivity of 4000DPI, tracking speed of 60 to 100 inches per second and an acceleration of up to 25g. "None of the DPI numbers on our mice are interpolated figures, which other mouse makers’ achieve by enabling tweaking of the software included with their mice. Our DPI specifications are all hardware-based, which essentially means what you see is what you get – true DPI," said Robert “Razerguy” Krakoff, president of Razer. Between the two regular mouse buttons, the Lachesis has a clickable wheel with blue LED backlight. The wheel provides nice tacticle feedback but it doesn't support tilting. 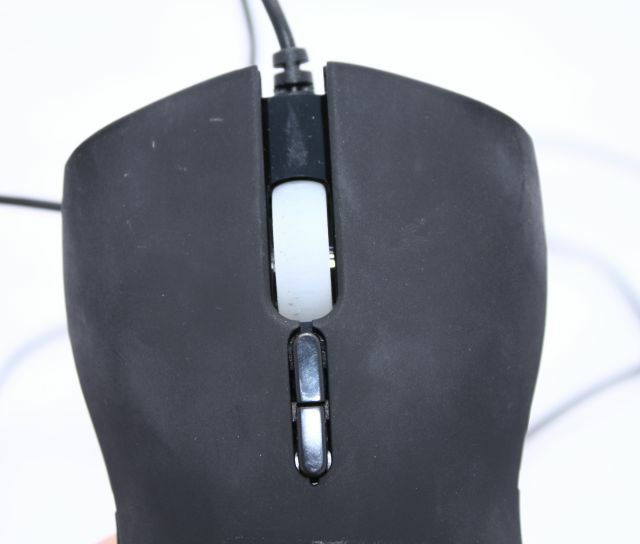 That's a bit of a let down as on other mice I frequently use the tilt wheel to quickly adjust to volume. It's a shame Razer didn't include this feature in the Lachesis. Two buttons are located under the mouse wheel, by default they are used to adjust the DPI setting but you can give them whatever function you'd like in the Razer Lachesis configurator. On the left side of the mouse are two buttons, the default function of these are "back" and "forward". 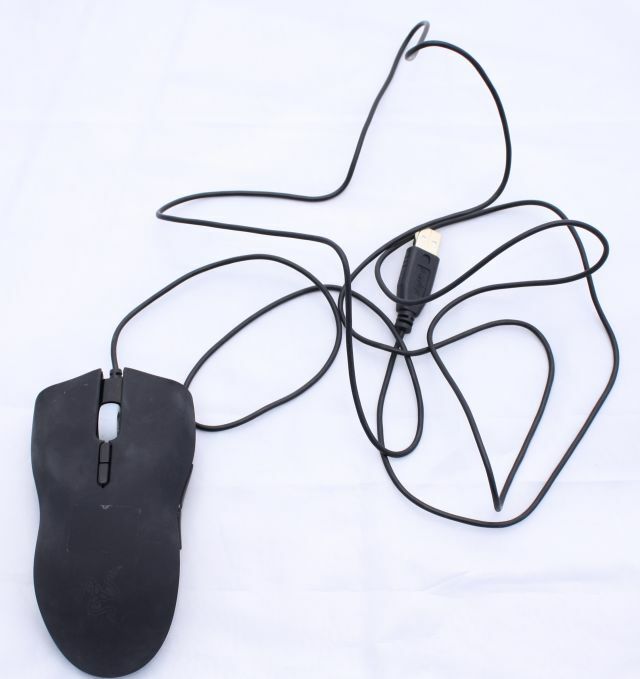 Another pair of buttons is present on the right side of this gaming mouse, they are used to switch between profiles. The Razer Lachesis has a seven-foot (213cm) long cable and a gold-plated USB connector. Installing the Razer Lachesis doesn't take too long. Plug it into your computer, download the latest drivers and check if your mouse has the latest firmware. Don't forget the last step, because a couple of months ago Razer released a firmware update that fixes some tracking issues. dont buy get the v2 of this,trust me i know i had 2 of these 400 dpi ones and the lazers are faulty the v2 5600 dpi uses a brand new 3.5 g laser and is perfect no problems with win 7 x64 iv had mine for going on 9 weeks now ! Awesome product that makes other pretenders look like crap. Razer's build quality is excellent and it just "feels" different. Good product but have had huge dramas with the scroll wheel. The rubber wheel spins on the axis making it useless unless it is moved quickly. The scroll wheel click has stopped working about 4 months after I bought the mouse. Over all it is very adaptive and the software is easy to setup once you read into it. Tried to RMA is and was a fail issue. WAS a good mouse to begin with but seriously will not buy another lachesis in its place. Great gaming mouse, have been using this one for over a year.